Parenting is a challenge of the best of times, but add a chronic illness like juvenile arthritis (JA) and your job gets much more difficult. Kim P Miller is mother to two boys who have JA and have used her experience to write a book to help other parents of children with JA. Living with Juvenile Arthritis: A Parent's Guide is written in the reassuring voice of someone who's been through it all and come out on the other side. Kim is a former NFL wife and frames the book in sports metaphors, helping you to get a game plan to deal with your child's chronic illness. The book provides down-to-earth advice and tips on dealing with the challenges of life with JA, such as preparing for doctors' visits, building a medical team, tips for "shot night," managing flares, dealing with the emotional impact on all members of the family and many more. Kim illustrates the practical sections with personal stories from: experience with her sons, Grant and Evan and stories provided by other parents, as well. Touchingly, both Grant and Evan also share their story. This book is a much-needed resource, helping families get through life with a child's chronic illness not just in one piece, but much stronger for it. Earlier this week, I spoke to Kim about the book and her experience as a parent of children with JA. Kim has an eclectic background. She was a ballet dancer at the Royal Academy in London at age 15, but "I blew out my knee and went to college early, graduating at 19." She went on to study for an MBA at Baylor University, where she met her husband Fred. He was recruited for the NFL and played professionally for 13 years. "We were a physically very active family and active in charity," Kim remembers. Despite being in the middle of Masters in Medical Informatics, as well as having spent five years as regional director of Nurses for Newborns in Nashville, Kim Miller found herself at a loss when her oldest son Grant experienced a serious recurrence of JA. The family had enjoyed five years of quiet, after Grant's first flare at age 2, shortly after the youngest boy, Evan, was born. When Grant's JA came back, it did so with a vengeance, causing severe flares. 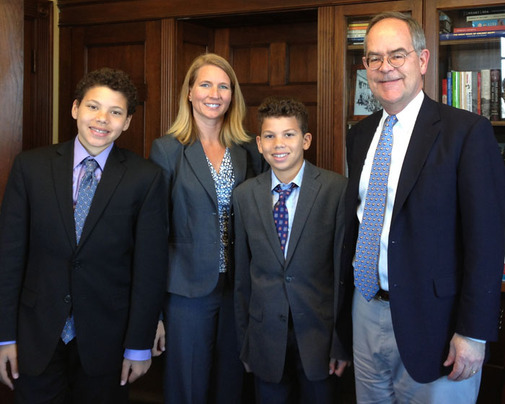 Recently, younger son Evan was also diagnosed with JA. However, the two boys' experience of the disease is very different. The younger boy Evan, who is now 13, has a mild case of JA, but 15-year-old Grant's disease is quite severe, with complications that required hospitalizations and in one case threatened his life. He is doing better now. "Grant hasn't been an in-patient for over a year and is more able to be a normal kid," Kim says. There is still room for improvement, though, "we are happy with the progress we are making, but not satisfied with where we are." Kim's experience gave her a unique set of skills to be the parent of a child with a chronic illness. Her involvement with Nurses for Newborns "connected me to the medical world, I understood how it worked. Pursuing my Masters in Medical Informatics help me learn how to do medical research." Still, "I wish I'd had something like this book when we were in the thick of it," Kim Miller says of the decision to write Juvenile Arthritis: A Parent's Guide. "In the beginning with the new diagnosis, everything is a foreign language." Kim's involvement in online forums for parents of children with JA made her realize that although each child and their JA is different, "some things don't change, such as knowing when to trust your 'mommy gut' and how to communicate effectively with your doctor and your spouse." When approached with an offer for a book contract, she spoke to her family about it and they decided that "this is a way we can make a silver lining." Her son Grant said that his mother writing a book that could help other parents and children with JA would mean he "didn't go through this for nothing." Framing the book within the sports analogy came naturally. "We're sports family we live and breathe sports. Fred was a pro athlete, the kids are very involved in sports. It's our point of reference." Kim explains that there are a lot of life lessons within sports such as "building the right team, learning to get along with other members of the team, having a head coach. JA is like a football game JA is the opponent and each game/child is different. We are fighting a game and outsmarting our opponent." The biggest challenge of parenting a child with JA is "finding the right balance," Kim says. "You don't want your child to suffer, so you can't push them too far." Discovering a way to enhance quality of life is also a challenge. "I used to be very rigid that responsibilities were always first, now I'm looser. I've learned to let go of the 'shoulds' a bit. For instance, Grant may not be feeling well enough to go to school, but later in the day, he can attend a birthday party. You have to find the balance between what you have to do, what you need to do and what you want to do. Your child needs quality of life." Feeling alone is also a challenge. "With parents of healthy kids, you can feel like you're blowing it out of proportion. They don't get it, your family doesn't get it. Connecting with parents of children with JA "can make you feel less crazy," Kim says. When writing the book, Kim wanted to show "the face of JA so people can see how dramatically different the different types of the disease is. Our story is not the face of JA, Grant and Evan are 180 ° different." Kim therefore contacted parents she knew and asked them to write the stories of their child's disease in the hope that someone was looking for answers, "they may be able to see their child in one of these stories." Kim's most important piece of advice to parents of children with JA is "try not to worry about things that haven't happened. Educate yourself, be prepared and rely on your parental instinct. You spend more time with your child than anyone, so if you believe there's something wrong, find a way to illustrate it." Years ago, she realized that "doctors are only people and they only see a 15 minute snapshot during an appointment." If you don't get the answers you need, "be persistent," Kim says.."Trust yourself." You can learn more about the book and juvenile arthritis on Kim's website Living with Juvenile Arthritis.